MISSOULA, Mont. 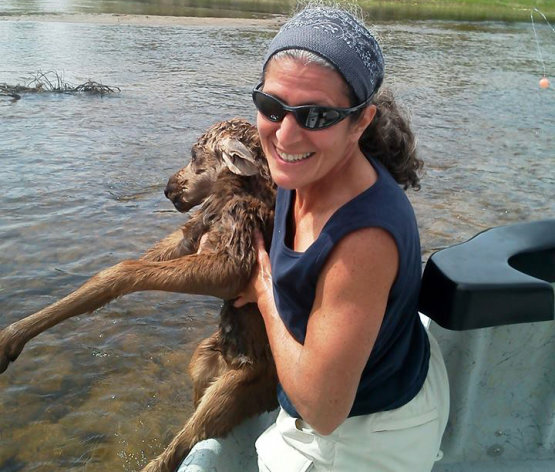 (AP) -- A Pennsylvania doctor on a guided fishing trip in southwestern Montana went home with an amazing tale of hauling in a 25-pound lunker — a baby moose she helped rescue from a rushing river. Karen Sciascia of Red Hill, Pa., and a guide were fishing the Big Hole River on Saturday when they spotted a cow moose with a calf trying to cross the waterway. "We were watching this adult female struggling back and forth, and we didn't see a baby until we got close," Sciascia told the Missoulian for a story published Thursday. "Mom kept pushing — the current was pretty swift. The mother bolted and took off across the river. She was trying to get across the main portion of the channel, and even she struggled." When the calf stepped off the gravel bar into the water to follow its mother, it was swept downstream. "It was small, and the river was swift," Sciascia said. "We lost sight of the baby. It was hurtling downstream and was being pushed by the river. It was too small to ever fight the current." Sciascia and guide Seth McLean with Four Rivers Fishing Co. in Twin Bridges followed downriver, finally spotting the tiny moose's nose just above the water. "We got up alongside it, and I just grabbed the little bugger. I scooped it up from the river under its front legs," Sciascia said. "I tried to hold it out, not wanting to get my scent all over it, but it was basically limp," she said. "It was breathing, and with my hand on its chest, I could feel its heart beating real fast." McLean rowed the raft upstream and snapped a photo before they dropped off the calf at the side of the river. The mother had disappeared into the woods but returned to the river after hearing the crying of her young calf. It sounded like a puppy, Sciascia said. "When we last saw her, we were heading downstream," she said. "The mother was heading toward it. She had come out of the woods and was heading toward her baby." Four Rivers Fishing posted the story, titled "Of Moose and Men," on its Facebook page Wednesday. "It was cool to be in the right place at the right time," Sciascia said.